At the age of six, wanting to become a singer, Stefano Bollani would accompany himself on the family keyboard. At the age of 11, he enrolled at the Luigi Cherubini Conservatory of Florence, where he received his diploma in piano in 1993. He started playing pop professionally when he was 15 years old, until he was heard by Enrico Rava, who immediately invited him to play in Paris with him. This was a start of a stellar career in jazz, which included a continuing collaboration with Rava, being named best new talent 1998 by Musica Jazz magazine, directing his Orchestra del Titanic, as well as recording and winning the Premio Carosone, usually awarded to singers, in September of 2003. His other accolades include the cover of Topolino magazine, being ranked eighth among new jazz talents and third among young pianists in the world by DownBeat, and among the five most important musicians of 2007 by All About Jazz. Bollani’s collaborators have included Richard Galliano, Gato Barbieri, Pat Metheny, Michel Portal, Phil Woods, Lee Konitz, Han Bennink, and Paolo Fresu, and his apprearances included some of the world’s most prestigious stages, from Umbria Jazz to the Montreal Jazz Festival, from Town Hall in New York to the Scala in Milan. 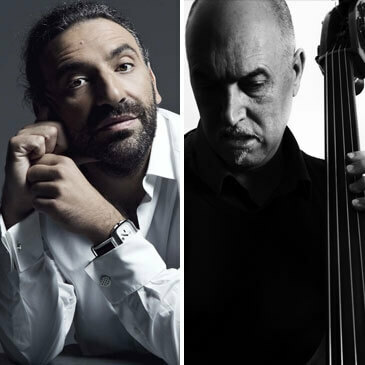 Born in Toronto, bassist Roberto Occhipinti is a well-established presence on the Canadian and international jazz scene. A five-time Juno Award nominated musician, he is equally at home playing classical music as well as jazz and world music. In addition to leading his own groups with four discs under his name, he has performed, toured, and recorded with Jane Bunnett, Hilario Durán, Jamey Haddad, Jovino Santos Neto, Don Byron, Jeff Coffin, Uri Caine, Bob Mintzer, Enrico Rava, Stefano Bollani, and Dafnis Prieto. He is an award-winning producer, whose recent projects include recordings for Dafnis Prieto, Vesuvius Ensemble, Dave Young, Michael Occhipinti-Sicilian Jazz Project, Hilario Durán, The Gryphon Trio, David Buchbinder’s Odessa/Havana project, and the 2015 Pan Am Games leading a band with Danilo Pérez and the Lula Panamania orchestra. Roberto Occhipinti made his Royal Conservatory debut on April 29, 2010, during Koerner Hall’s inaugural season. All of the other artists are making their Conservatory debuts tonight.